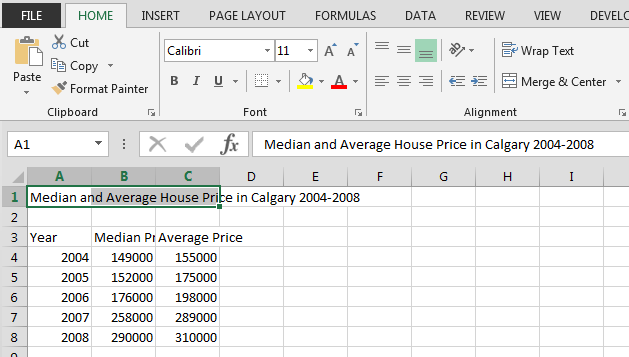 Download "Creating Simple Tables and Charts using Microsoft Excel 2013"
1 2015 Bow Valley College 1 Microsoft Excel Vocabulary Creating Simple Tables and Charts using Microsoft Excel 2013 Column: A grouping of information or data organized from top to bottom. 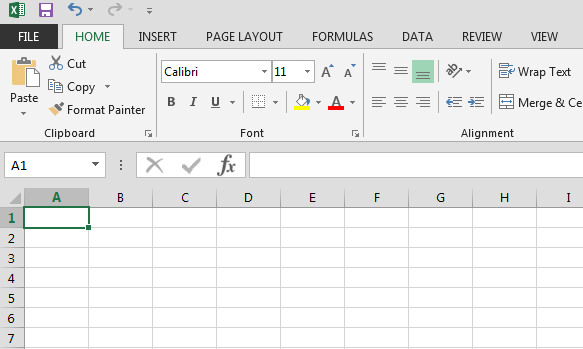 In Excel columns are named with letters A-Z. Row: A grouping of information or data organized from left to right. In Excel rows are named with numbers starting with 1. Cell: A cell is the location where a column and row meet. In Excel these are named with the column letter and the row number. For example, where column A meets row 3 the cell will be named A3. Range: When rows and columns have information organized and displayed this is called a range of data or information. Table: A table is created from the range of information. This is the display of information in an organized way. Tables have clear headings for columns and rows of information. Chart: This is a visual graph created from the range or table. Vertical Axis: A vertical axis appears on a line or bar chart. It is the information along the side of the chart. (Up and down) Horizontal Axis: A horizontal axis appears on a line or bar chart. It is the information along the bottom of the chart. (Side to side) Creating a Range or Simple Table of Data: 1) Click on the cell that you want to enter the information. 2) Type the information in the cell. 3) Press ENTER on the keyboard. 4) Repeat steps 1-3 until all the information both numbers and headings is in the range. 1) Click in the cell. 2) Type the information. 3) Press Enter on the keyboard. 3 2015 Bow Valley College 3 1) Merging Cells 1) Select the cells that you want to merge- the cells MUST be next to each other in the same row or column. 2) Click the Merge & Center button (see the picture below). 1) Select the cells you want to merge. For example cells A1, B1 and C1. 2) Click the Merge button. After pressing merge the cells will look like this: 2) Resizing Rows 1) Place the mouse pointer on the line under the NAME of the row you want to resize. For example: to make row 1 larger click on the line below the 1 on the far left-hand side of the screen. 2) Click and hold the mouse and drag the line down to the size you want. 1) Place the mouse pointer here to resize row 1. 2) Click and hold the mouse and drag the line down. 4 2015 Bow Valley College 4 3) Wrapping Text After resizing the row to make it big enough for two or three lines of text you can wrap the text in the cell so it can all be read. 1) Click in the cell you want to wrap (change so it uses more than one line). 2) Click on the Wrap Text button found in the Home Tab. Click the Wrap Text button. 3) After pressing Wrap Text the cell may look like this: Wrapped text. 4) Resizing Columns 1) Place the mouse pointer on the line to the right of the NAME of the column you want to resize. For example: to make Column C larger click on the line to the right of C at the top of the sheet. 2) Click and hold the mouse and drag the line to the right until it is the size you want. 1) Place the mouse pointer here to resize column C. 2) Click and hold the mouse and drag the line to the right. 5 2015 Bow Valley College 5 5) Centre Text in the Cell Text in cells can be centred instead of left or right aligned. This is usually done with titles of columns for a cleaner look. 1) Click in the cell you want to centre, this will select that cell. 2) Click the Centre button in the Home Tab to centre the text. 3) Repeat with all cells you want to be centred. 1) Click the cell you want to centre. 2) Click the Centre button. The end result will look similar to this: Centred text. 7 2015 Bow Valley College 7 4) The end result will look similar to this: Borders on the cells in the range are black. 7) Add Colour to Cells 1) Select the cells to add the colour to by clicking and holding the mouse and moving over the range to colour. 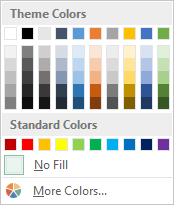 2) Click on the arrow next to the Fill Colour Button on the Home Tab to open the colour options menu. Click here to open the colour options menu. 3) Choose a colour and click on that colour. Click on your colour choice. 8 2015 Bow Valley College 8 4) The result will look similar to this: Cells with colour added. 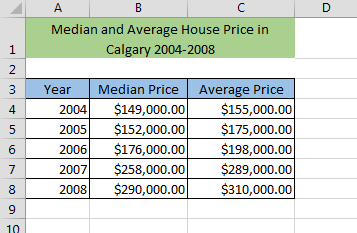 Creating a Chart from a Range of Data: 1) Select the range of data that will be included in the chart. Only the information to be included in the chart is selected. 3) Click the Insert Tab. Click here. 4) Click on the Recommeded Charts. 9 2015 Bow Valley College 9 5) Click on the chart that works best from the list. Click on the chart that works best. 6) Your chart will now be automatically inserted on the page. Below is an example of what it can look like. 10 2015 Bow Valley College 10 Completing a Chart Now that the chart has been inserted onto the worksheet it can be completed with titles for the horizontal and vertical axes and a title for the chart. The chart can also be changed to be easier to read. *NOTE: To make any changes to the chart you must first SELECT the chart by clicking in a BLANK SPACE that is part of the chart. In this example the chart blank space is here. 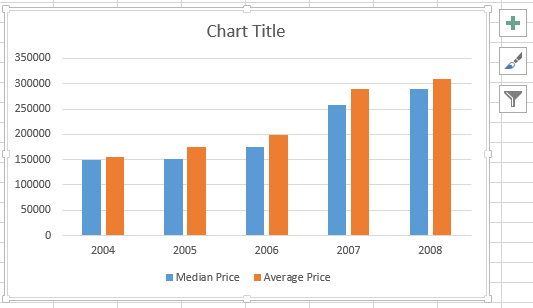 Adding the Horizontal Axis Titles 1) Click in a blank space on the chart to select it. 2) Once the chart is selected you will have access to the Chart Elements beside the chart. Click + sign to add a label to the horizontal axis. Click the + sign for the Chart Elements. 4) Click arrow next to Axis Titles and then click Primary Horizontal. Click the arrow and then click Primary Horizontal. 11 2015 Bow Valley College 11 5) This will place a text box below the Chart that says Axis Title. 6) Click inside the text box and type the title for the Axis. This example would have the title Year Click inside this text box and type your title. 7) Click in a blank space on the chart. 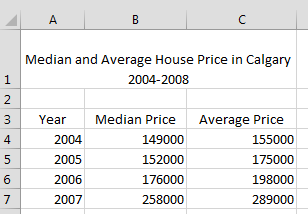 Adding the Vertical Axis Label 1) Click in a blank space on the chart. 2) Click on the + sign to open the Chart Elements. 3) Click on the arrow next to the Axis Titles button and click Primary Vertical. Click the arrow next to Axis Titles and then click Primary Vertical. 5) A text box will appear on the vertical axis. Click on the text box and type the title for the axis. For the example shown the title is Percent. Click inside this text box and type your title. 12 2015 Bow Valley College 12 Adding a Title to the Chart 1) Click inside the box where it says Chart Title. 2) Delete the words Chart Title and type the title for your chart. 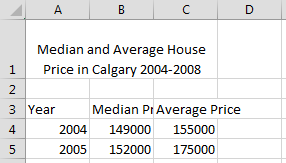 The example chart has the title Median and Average House Price in Calgary Click inside this text box and type your title. 6) Click on a blank area of the chart. Fix up the Chart You now have a table and a chart that can be copied from Excel and placed into a Word or other document, or stay as part of the Excel workbook. This chart can be resized, the vertical and horizontal axes can be formatted in various ways, all changing the way the chart looks on the page. To get to the options, right click with the mouse where you want to make the change (for example, on the horizontal axis labels 1996, 1997 etc. ), and click on Format Axis. This will take you to all of the options you can try. See what is there, try them out and find out what happens. If you make a change you do not like, click on the Undo button at the top of the page to take it back to the way it was. Click Undo to fix any changes you do not like. 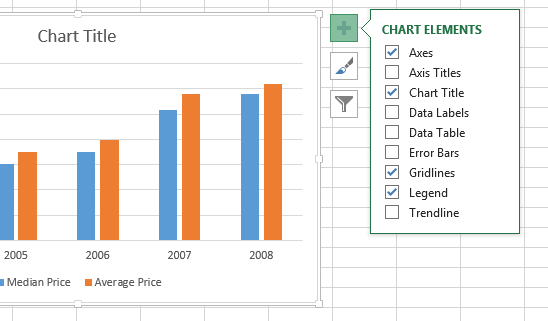 This activity will show you how to draw graphs of algebraic functions in Excel. 3 The following diagram describes the tools in the DRAWING Toolbar. Insert. Insert Picture. Text. Chart. Line Colour. Insert WordArt. Insert. Table of Contents Graphing with Excel 1 1. Graphing Data 1.1. Starting the Chart Wizard 1.2. Selecting the Data 1.3. Selecting the Chart Options 1.3.1. Titles Tab 1.3.2. Axes Tab 1.3.3. Gridlines Tab 1.3.4. Supporting BSBITU202A Create and Use Spreadsheets and BSBITU304A Produce Spreadsheets in the Business Services Training Package. [Type here] Using Excel for your assignments This document covers the basics of using Excel to perform simple data analysis and represent that data visually. Excel is a very powerful data analysis tool.